We love our pocket pets! Does Fluffy have an oozing mole that you are afraid to put her under for? Does Fido have an annoying cyst but finances are tough? Cryotherapy maybe a good alternative! Pet Emergency? Call us right away at 610-841-4470! If you live in OREFIELD or the surrounding area and need a trusted veterinarian to care for your pets – look no further. Lucinda Schlofer is a licensed PA veterinarian, treating all types of pets. Your pets’ health and wellbeing are very important to us, and we take every possible measure to give your animals the care they deserve. 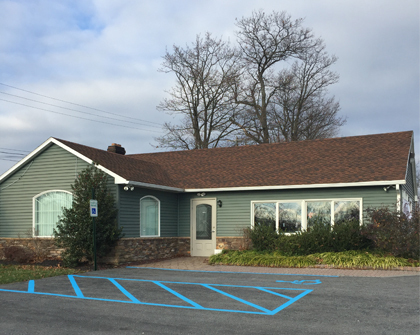 Orefield Veterinary Clinic is a full-service animal hospital and welcomes both emergency treatment cases as well as pet patients in need of routine medical, surgical, and dental care. Lucinda Schlofer has years of experience treating serious conditions and offering regular pet wellness care. Beyond first-rate pet care, we make our clinic comfortable, kid-friendly, and calm, so your pet can relax in the waiting room and look forward to meeting our OREFIELD veterinarian. We are happy to offer a number of resources that enable you to learn about how to take better care of your pets. Please feel free to browse our site, particularly the informational articles. The best veterinary care for animals is ongoing nutrition and problem prevention, so becoming knowledgeable about preventative pet care is essential to the ongoing success of your animal’s health. If you have any questions, call 610-841-4470 or email us and we'll promptly get back to you. Our OREFIELD veterinarian office is very easy to get to -- just check out the map below! We also welcome you to subscribe to our newsletter, which is created especially for OREFIELD pet owners. 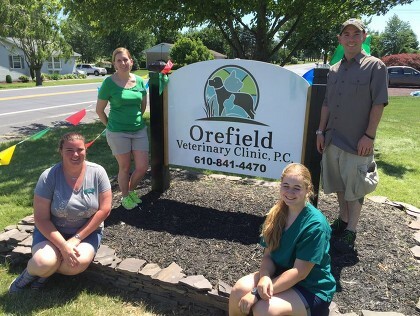 At Orefield Veterinary Clinic, we treat your pets like the valued family members they are. Dr. Lucinda Schlofer, DVM Dr. Lucy was born and raised in Montclair, NJ. She obtained both her Bachelor's and Master's Degrees of Science from Arizona State University in 1995 and 1996, respectively. In 2001, she obtained her Doctor of Veterinary Medicine from Oregon State University. She worked in Santa Fe, NM, at a mixed practice before moving to Pennsylvania. She has been practicing mostly small animal medicine since then. Besides dogs and cats, she has special interest in pocket pets and alpacas. She lives on a small farm in New Tripoli with her husband and two children. Her fur kids include 2 horses, 1 alpaca, ducks, chickens, 3 barn cats, a house cat named Spitfire, a Pitbull mix named Bella, a rabbit named Max, and a goldfish. Andy graduated from the LCCC/NCC veterinary technician program in 2006. He has worked in veterinary practice since 2000, and has worked with Dr. Lucy almost his entire career. A lifetime local, raised in Whitehall PA, now residing in Lehighton with his wife and daughter. Their furry children include a few physically handicapped cats, and four dogs: Emmit, a pitbull with special needs, Tito a Chiuhuahua, Rosy a yorkie, and Eli an American bulldog/pitbull mix. Heather joined our staff after many years of working in the early childhood education, but has found over the years veterinary medicine is not much different. 'I love coming to work everyday! Ever since I started working here at Orefield Veterinary Clinic I have been learning as much as I can about pet health and well being. She lives in New Tripoli with her husband and 2 children, 2 dogs Rascal and Ruby, and 2 cats Stewart and Simon. She can't wait to talk to you to help you make an appointment. "Dr Schlofer and the whole staff are fantastic and you can tell that they love animals. My dogs are part of my family and I wouldn't take my family anywhere else and you shouldn't either!" "Dr Lucy and staff are wonderful! You can tell they all really love animals and want to make sure your pet is taken care of."